Register Log In GliderCENTRAL Forums Bonding & Relations what to do with the last glider? I rescued two adult females (Ori and Cleo) some time ago and since my youngest glider in my current sister pair is still pretty young I thought I would take the introduction very slowly, which I have done. They have now swapped pouches, cage swapped, had their cages side by side and even had a tightly nettet travel cage inside the bigger permanent cage. I decided to take all of yesterday and night to introduce Ori to my sister pair, since she's in general very mild and gentle and I had the time and patience for a bad night of sleep to make sure everything went well. It all went pretty smoothly, which I'm very happy about and they now sleep peacefully in the same pouch! but now comes the tough part, getting Cleo used to the others. She's quite shy and reserved and at the same time very strong willed and seems more territorial than the others and she's definitely not as gentle. Although she and Ori slept together when they were in the same cage, they never really seemed to play or do anything together and merely seemed to just co-exist in the same cage and occasionally groom each other. Cleo seems to be the most fearful of the gliders and she's also the crabber, though I can't really read if she's all that serious when she crabs or if it's just for show. As you can probably tell, I have a pretty hard time reading her, which makes it all the more difficult and nerve wrecking. What do you guys think of the whole situation? Introduce them to your shy glider one at a time. Do this in the morning in a neutral area. When she accepts the first glider then add a second and so on. Once they are all introduced, provide multiple pouches for them to sleep in and multiple feeding station. 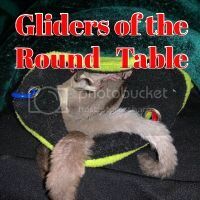 At least one per glider for a while then if they are not arguing over food you can cut down to one dish per 2 gliders. would you introduce them over several days and let them sleep together during the day and separate them during the night? and then if everything goes well try to keep them in the same cage next weekend when I have the time to be up with them? or would you put them together in a neutral cage the same day they seem to accept each other in the pouch? I would start with swapping pouches, then swap cages. After you have done this for about 2 weeks introduce them in a neutral area in the morning. If they are good and go into the same bag to sleep, then put them in a bonding pouch and wear them for the day. While they are sleeping that day, deep clean the cage they are all going to share. Scrub the cage, wash all fleece, toys and wheels. Put at least two sleeping pouches in the cage and return them to the cage once it is deep cleaned.